Right up near the Stazione di Santa Maria Novella train station and close to the Fortezza Da Basso is a hidden little gem of a restaurant called “Trattoria I due G“. I was hinted several times about this place having simply the best “fantastico” black truffles dish in Florence. I envisioned a crowded fancy over-plated dark environment but that perception quickly diminished after coming here 4 times. Yes, we came here 4 times in a span of a few days for many reasons. First off, we had to try the truffles, secondly we had to bring more people to experience the truffles, thirdly it was near our clients, and 4th, my group had little success in finding other good restaurants in Florence, hence returned here. Imagine an extremely traditional, family run, local restaurant in Florence filled with only locals, wine staffed up high, pictures and paintings mounted on every wall, and a staff with much personality and charm almost from a book you had read when you were younger(maybe Lady and the Tramp) . Nothing too fancy, just simple, clean, and to the point. Cooks would come out to greet customers like family and serve dishes along with a story or joke each time. The environment was charming with bricks on plastered white walls, picture frames, checkered red tables cloths, and chandeliers draping from fairly high brick ceiling. Enough about the space, let’s see the food! Food and pics after the jump! My first experience of an Italian restaurant brought me to a tiny cozy place called La Giostra Ristorante nearby the central Duomo and hidden in a small alleyway on Borgo Pinti Street. The cabin like space was lit up with a cascading assortment of flickering ceiling lights, aisles of rustic wine bottles, melting wax candles on every table, laughter, and a warm welcoming by the pirate like passionate owners. I came here my first day and last day, so I’ll be posting on both these occasions at this wonderful restaurant which I’d highly recommend for a tasty enjoyable meal. If you dig into their site, you’ll find a set of pictures taken by celebrities who have been there, which are also plastered on the restaurants interior. More pics and yummy food after the jump. My first stop in Florence was at TASTE, a 3 day food gathering of Italy’s finest foods ranging from jams, wines, cheeses, meats, chocolates, and much more from over 160 select exhibitors. This mouth watering event allowed attendees to eat, taste, question and buy products from a wide range of creators and distributors around Italy, though many of them seemed to be small independent family run organizations, which I liked. 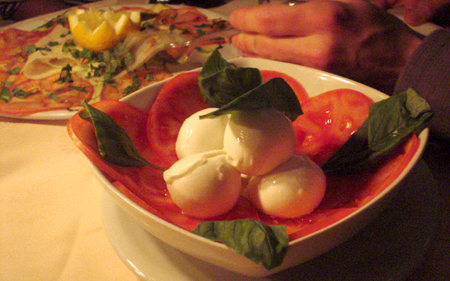 The highlight of the event for me is pictured above….it’s buffalo mozzarella! Simply Amazzzing!! My trip to Italy/Milan started off with a frustrating cancellation during a crazy winter storm on March 16th in Boston. Snow lashed in multiple directions at 45 degree angles and a foot of snow dropped within an hours time. My flight with Northwestern Airlines was cancelled while the Boston airport closed at 8pm though it opened up spontaneously after 9pm to allow some flights in and out. Upon my cancellation, I was booked on a NW flight 4 days later which I found ridiculous. 3 phone calls to different NW operators resulted to no resolution. I asked about getting booked on another airlines, but their policy does not allow this if it is due to weather. Oh crap I said… my client meeting is in 3 days..I can’t show up the day after. I’ve been dancing and prancing around Florence for the past week and will finally have time to check out the city over the weekend. A stop by the Duomo, the huge galleries, and famous churches is a must. The architecture here is charming, unique, and fluent thriving with colors and hand made rustic materials. Food so far has been ok….a few amazing meals (truffles above, egg noodles, mozzarella(buffalo), meat, salads), and a few misses due to my trust in touristy areas. An endless supply of amazing wine, cheese, coffee, and gelato exists in every corner while the weather has been cloudy, rainy, but sunny at times. If the weather is nice over the weekend, I’ll probably rent a Vespa and cruise abouts the hills fashionably with my camera in one hand. The people I have met so far locally are incredibly friendly, fashionable, jazzy, and passionate about Italy. Many of them smoke, all of them ride Vespas, and all must have coffee. The city of Florence is annoying to an extent that there are toooo many tourists and some local businesses take advantage of that in unkind ways. The nightly streets are packed full of fake brand goods, but it gives the place charm in a funny way. I’m trekking over to Milan on monday, so if you have any must do’s there, let me know..otherwise, I only plan to visit a few churches and the Italian Design Triennale as my flight is the next morning back to gloomy yet good ole Boston. I’ll have a more visual report once I return, but for now, I’m going to experience Italy and try to stay away from my laptop as much as possible besides work reasons. Ciao! I’m off to Italy this weekend for a brief research project dealing with experience design and fashion to some extent. While there, I’ll be diving into their culture, food, wines, and anything inspirational. If you know of any must see or eat places, let me know. (must eat restaurants are always welcome 😉 ) A majority of my time will be in Florence and surrounding areas, but a few hours will be in Milan. I’m not sure how much time I’ll have to post any finds while there, but rest assured that if I find a wireless network, I’ll post something. ciao! Here’s something I would have never thought up….serving dinner in total darkness as a restaurant theme. I love the idea of heightning your senses for food, but I wonder how many times I would flip food into my face or nose. I guess I’d avoid the noodles or soups and hot BBQ plates. Otherwise, I wonder if the users eat like blind cavemen using their hands. A dark room food fight with thousands of marshmellows could be fun. “The first dark restaurant in Asia is officially opened on the 23 December 2006. This restaurant, located in Beijing, China, has its interior painted completely black. Customers are greeted by a brightly lit entrance hall and will be escorted by waiters wearing night vision goggles into the pitch dark dining room to help them find their seats. Flashlights, mobile phones and even luminous watches are prohibited while in this area. I’m not sure how useful this is but it’s a definite step in trying on products virtually. “A new technology puts an end to the tedious business of buying shoes: Customers can now try on a variety of models in front of a virtual mirror without changing their shoes. 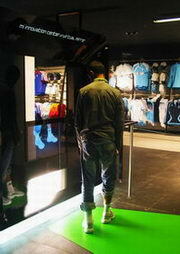 They can navigate through the collection by simply pointing at products on a computer screen. I’m not sure when I’d actually use this type of tech as a deciding factor since I’m the tangible type that’s got to get the product in my hands, but then again, I buy stuff online now without touching them, sometimes hating what I receive, then getting too lazy to return anything. Virtual haircuts, makeup sessions, workouts, cloths, jewelry, watches, shoes, socks, etc… who knows.. this kind of tech reminds me of that Epcot center ride that projects an interactive ghost next to you towards the end of the ride and you kind of freak out since nothing appears next to you physically but in the mirror exists some weirdo pricking your hair and scratching your head. A few weeks back the iconic creators of Voss Water sent me a case of their new drink G Pure Energy to try out. (thanks melissa!) At first I thought it would be another over caffinated and marketed drink in a very busy sector, but oh was I wrong. I was sent two awesome flavors: Orange Blossom and the Zero Carb Lime both in their squeeze shaped glass bottles with metalic covers. I was also sent a folder containing some zesty cocktails mixes which I have not had a chance to try out but will do so for some upcoming spring parties. So now for testing it out… I snapped open a chilled bottled and gave it a sip. It was snappy, fresh, smoothe, and poppy like champagne. It had a soda like touch but much cleaner without the sugar though sweet enough to enjoy. Unlike many other energy drinks, it didn’t leave a weird after taste, but more like a healthy dose of carbonated water with a kiss of sweetness. Super chilled was a must. It was almost like carbonated water with a bit of a zest which I enjoyed. The only minus was that these bottles emptied fast at 200ml. I’m not sure how much energy these actually gave me but the refreshing zest made me smile. I’ve never seen these in stores, but if you do, give it a go! I’ll post a pic of two of the bottle chillin in the snow on my porch after the jump. I’m back from the mind-boggling TED conference and am detoxing my brain from the incredible stories, experiences, and knowledge shared by the hundreds of shakers and movers present there. My minds exhausted and happy while my bodies trying to catch up all at once. 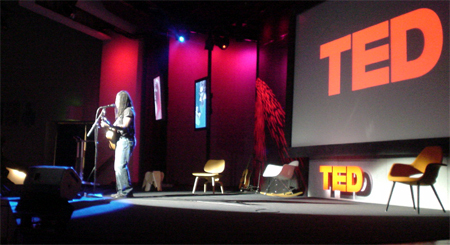 As usual, I’ll point to Tom, Ethan, and Brunos blogs for their incredible recap on the TED speakers this year. As I slowly absorb and digest the many wonders of TED I’ll post them on up with my thoughts. For now, I’ll post a few glimpse of my journey there. Overall, the TED Experience was incredible as usual with a diverse crowd of individuals craving to learn more about every topic imaginable. There was a new simulcast room with HD plasmas hovering over beds and comfy bean bags, a new chocolate tasting section which was oooo so yummy and satisfying thanks to Vosges, a few demo booths by various sponsors, a big gift bag, a cool IT help desk, an amazing photography studio, an addictive Google Snack bar, and much more. One thing I missed was the Aquarium party that usually happens on Friday night but was instead moved to Tuesday night for the speakers party hosted by Google. This years Grand party took place in an airport hanger which was cool, but by no means as magical as the Aquarium. The after Conference Beach party was very good as previous years ended with no party. I could go on and on about this years event, but much like JJ Abrams comments on his magical box, I’ll keep that to a mystery but post a few pics for a glimpse of my experience. Enjoy! 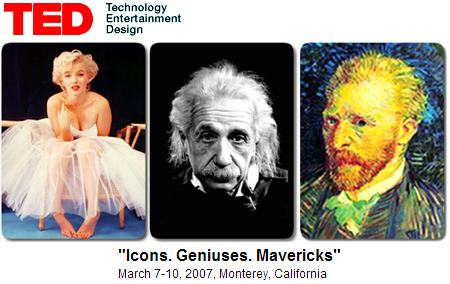 I’m off to my 5th inspirational brain safari known as the TED Conference (Technology, Entertainment, and Design) over in Monterey, CA this week. This years speakers list is pretty damn amazing but as usual the conversations with attendees into the late nights will be the most memorable. If you have not had a chance to dive into the world of TED you can catch a glimpse through TEDtalks (my selected picks here) or by exploring their site. I’ll post the captivating daily speaker schedule after the jump though the interactive one on their site is a bit more useful.